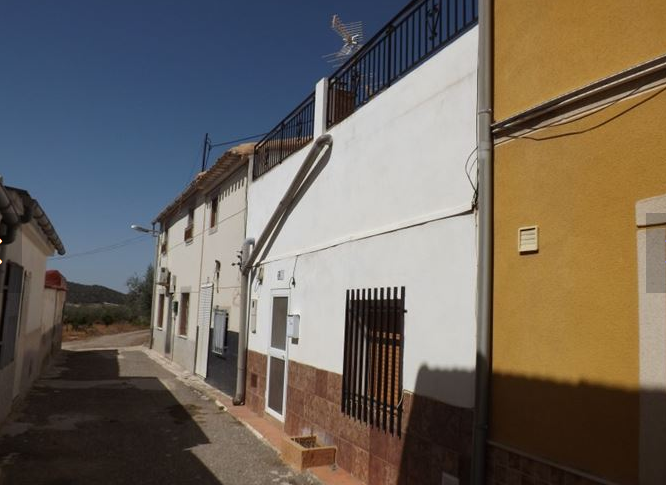 This property for sale is located in the village of Zarzadilla de Totana, in the region of Murcia. The property has 2 en-suite bedrooms. In the house there is also a lounge/diner room, a fully fitted kitchen with a utility area, a sun lounge, an office, a roof terrace and a solarium. The property will be sold fully furnished and so will suit anyone who wants to move in straight away or if you want to rent this property out. There is a beautifully landscaped garden and there are amazing views of the surrounding area from the terrace. 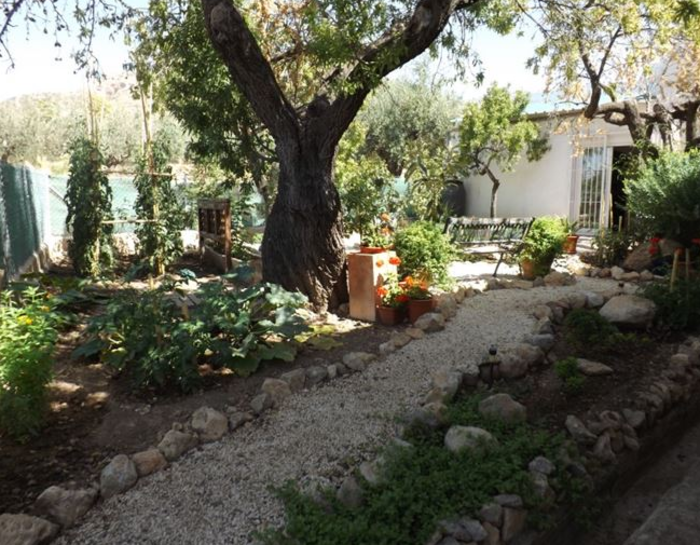 The garden is well designed with mature trees, shrubs and vegetables. 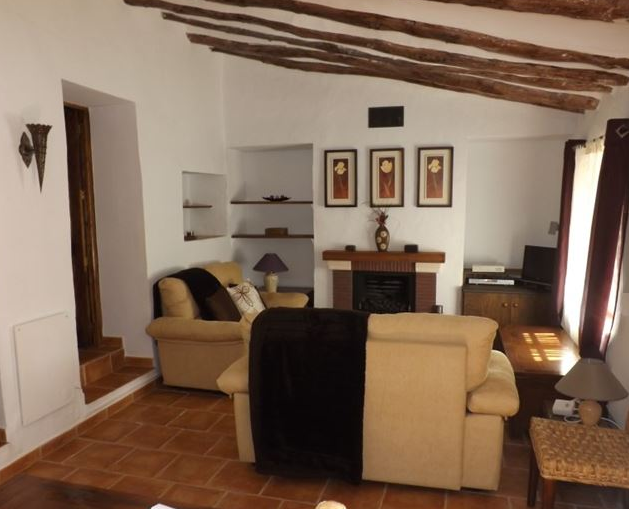 The property is located in the heart of the village and it is only 20km from the Town of Lorca. Zarzadilla is approximately 45 minutes from the blue flag beaches of Aguilas and approximately 1hr 15 mins to San Javier Airport. The village has the convenience of a pharmacy, fresh fish shop, supermarket, 3 bars, bakery, medical centre, junior school, bank and natural water spring which you can drink. Local suppliers come to the village with bread, fish, meats and vegetables. From the street you enter into the lounge/dining room. 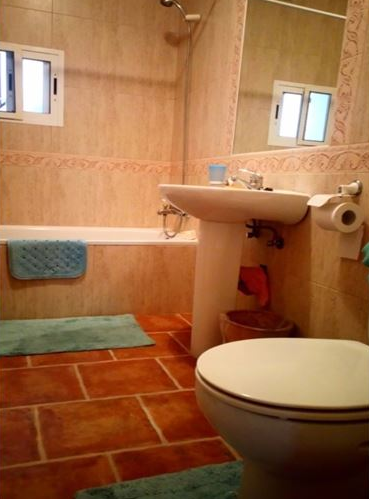 From here you have access to the kitchen, bedroom 1 and bathroom 1. 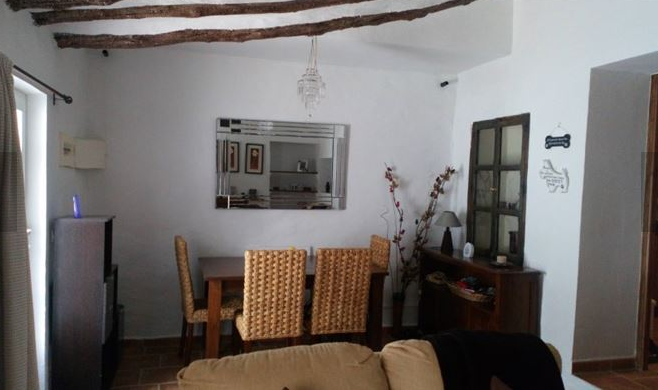 A characterful and very spacious dual aspect room with many traditional Spanish features including a vaulted ceiling and fireplace with fitted gas fire, which makes a lovely area to relax. The dining area is set to one side of the room and comprises of a dining table and chairs with a drinks cabinet behind and an archway leading onto the kitchen. 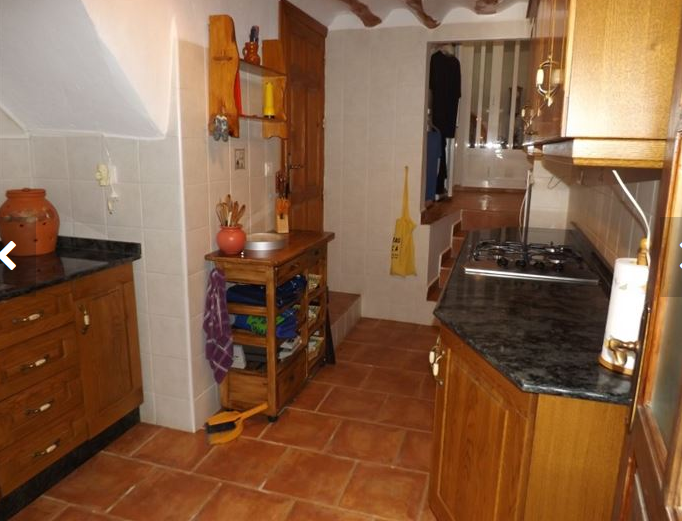 The kitchen is set in two rooms with one leading onto the other. 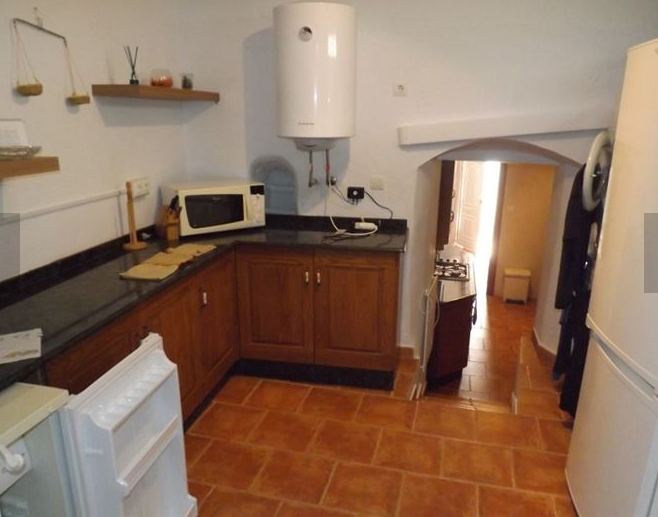 The first room houses the gas hob, electric oven and sink on two separate granite worktops. The second room (utility) consists of a small under unit fridge as well as a tall fridge freezer, microwave, electric water heater, tumble dryer and washing machine. Both rooms have plenty of floor units. Door to rear conservatory and door off first part of kitchen to upstairs. A lovely sitting area with a small room to the right ideal for a study fitted with a small freestanding almond shell burner. 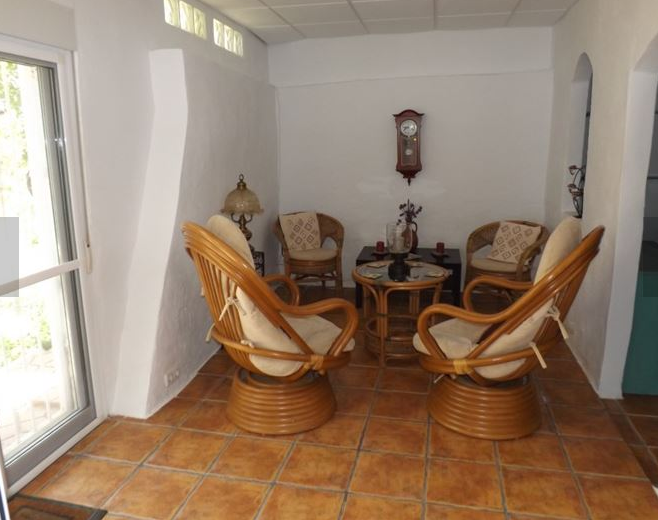 The conservatory is nicely decorated and has a fully tiled floor and access to the garden through patio doors. Stairs to roof solarium. Metal stairs take you to this lovely tiled area perfect for al fresco dining or sun bathing with views of the surrounding mountain ranges. 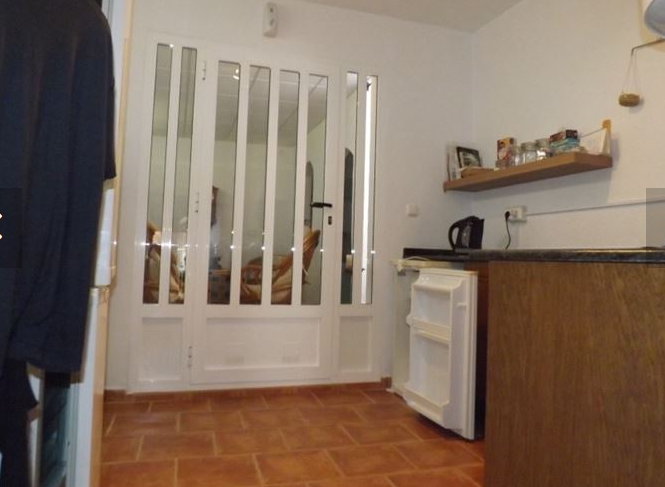 Access to the inner stairs is via a door in the first part of the kitchen. The stairs lead you to the second bedroom with en-suite and the front roof terrace. 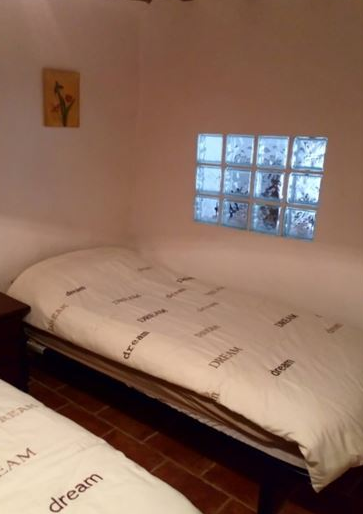 A large double or twin room with an en-suite bathroom, vaulted ceiling and large wardrobe. The en-suite bathroom is fully tiled with pedestal wash hand basin, WC and bath with a shower above. with en-suite shower room. A very large double room with single aspect, vaulted ceilings, built in wardrobes, storage chest and en-suite shower room. The en-suite consists of a w.c., pedestal wash hand basin and a walk-in shower. This terrace is situated at the front of the property which has a metal railing surround and is accessed via a door from the inner staircase leasing to the first floor. The terrace accommodates the satellite dish but would easily fit a table and chairs set or sun loungers. A very decent sized garden accessed via a door from the rear conservatory. The garden is very private and fenced and comprises of multiple fruit trees and lovely planted areas. including a vegetable garden. There is a small wooden storage shed adjoined to the house to the left as you step out onto the patio area. Open land to the rear and side. The roof is new with a lifetime guarantee. There is ample parking spaces approximately 20 yards from the property. The owners have increased the electricity supply so many appliances can be used at any one time.